An outraged ANC has instructed its lawyers to take legal action against the Goodman Gallery in Johannesburg over what it called a “distasteful and indecent” portrait of President Jacob Zuma by satirical artist Brett Murray. Party spokesman, Jackson Mthembu, said the ANC had instructed its lawyers to approach the courts to compel Murray and the gallery to remove the portrait from display and destroy all printed promotional material. He said “this distasteful and vulgar portrait” had also been reproduced in a weekend newspaper and on its website, and the party had instructed its lawyers to request that it be removed from the website. City Press reported on Sunday that the portrait had been bought for R136 000. The party also objected to the depiction of its logo, without its permission, bearing the inscription “For Sale”. 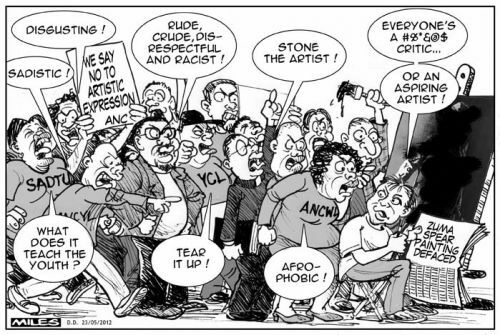 Mthembu said that while the ANC believed in freedom of the press and artistic expression, the “vulgar portrait and the dismembering of the ANC logo by Brett Murray is an abuse of freedom of artistic expression and an acute violation of our constitution, apart from being defamatory”. The Goodman Gallery’s Lara Koseff could not be reached for comment on Thursday night. Presidential spokesman, Mac Maharaj, declined to comment, but said the presidency would review it today. City Press executive editor, Fikile-Ntsikelelo Moya, was quoted as saying the paper would not remove the portrait from its website. He said that it would respond when served with court papers. Mthembu said the ANC had been made aware of the portrait by the media.